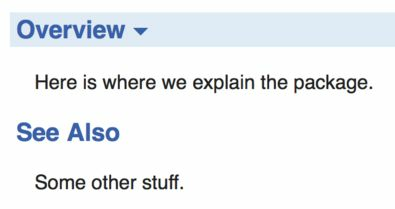 Go has a great emphasis on simple, no-nonsense documentation right out of the box. 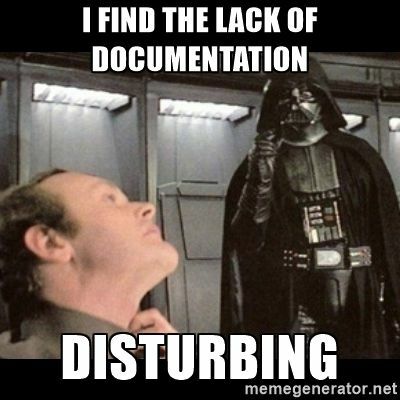 Rather than using an existing format (like Markdown) where formatting is often explicitly stated godoc uses many implicit rules to extract quality documentation from really plain text so that you can spend less time formatting your documentation and more time writing it. godoc can produce docs in several formats, such as text (similar to a man page) but the most common one you will come across is the HTML version. In this article I will be focusing on how the formatting is produced rather than how to use the godoc command-line tool itself. It has a whole bunch of other options that are well documented. // Copyright Some Company Corp.
// Here is where we explain the package. 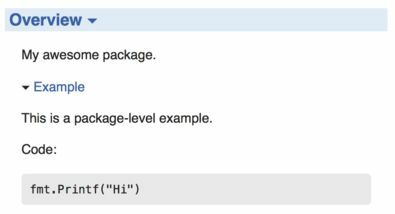 Package level documentation must be in a continuous comment immediately preceding the package statement. If there is a blank line between the comment and the package statement it will be discarded. 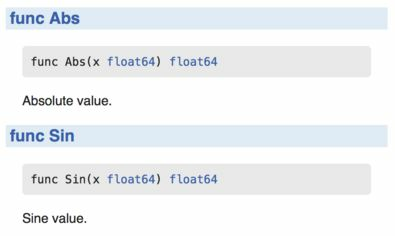 This is how you add comments that should or should not be included in the general package documentation. Since a package can be made up of more than one file you can spread the package documentation across files and godoc will merge all of these into the same Overview block. The order, as far as I'm aware, is not guaranteed to be predicable. But it does offer a nice way to document parts of the package in the individual files that make sense. Alternatively, you can add a file to your package which contains no code but the complete package documentation and a single package statement if that makes sense too. To make wrapping long continuing lines easier godoc will assume that all subsequent lines are part of the same paragraph. However, you can explicitly separate paragraphs with a blank line (you still need to put the // so that the comment is one continuous block). If you're familiar with Markdown then this works the same way. // The port number for the host. // This appears under the const. // This causes Foo to happen. // This causes Bar to happen. // Documented, but not visible. // Docs are important even for internal stuff. Go is sensitive to things that look like (or don't look like) sentences. godoc recognises a line that starts with a capital letter and does not end in a full stop as a heading. Code blocks do not employ code-colouring, but this means they can be used for documenting any other non-go code, such as bash. // See https://godoc.org for more information. 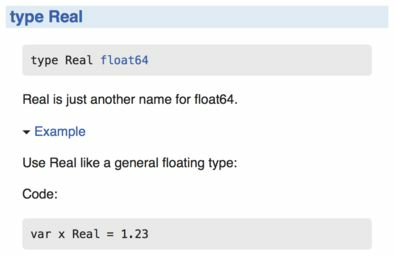 // Real is just another name for float64. This same strategy is used for methods. In all cases if you need to provide more than one example you can add an underscore suffix after the method name to name each example. 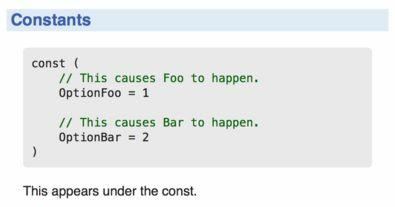 The name of the example will also be shown in the documentation. 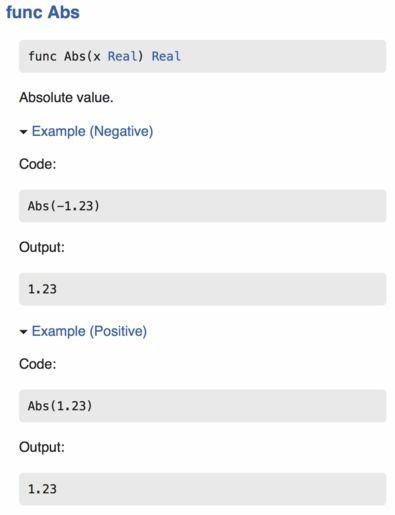 Also, a special comment can be used to designate what the output of the example will be.